In defiance of the appalling conditions in Cork Harbour today (Fri) seventeen races were successfully sailed thus completing the quarter final stage of the 2014 ISAF Women’s Match Racing World Championships. Strong Winds gusting almost 30 knots and heavy rain delayed proceedings for a number of hours. Shortly after noon the breeze dropped to 18 knots and the eight teams made their way out to the calm waters below Camden Fort Meagher to begin Day 3 of the regatta. Paired randomly, the first four teams to win three races apiece would be the ones to advance. With a five hour battle ensuing, the sailors went head-to-head for the coveted semi-final places. First to qualify was overnight leader and World #1 Camilla Ulrikkeholm from Denmark. She and her three-woman crew expertly claimed three consecutive wins against Klaartje Zuiderbaan knocking the Dutch team out. World #2 Anna Kjellberg then reigned supreme in her fight against the French Anne-Claire Le Berre. Having already lost two teams, Ireland’s remaining chance depended on the Kiwi team skippered by Claudia Pierce but crewed by three Irish girls. The Kiwi team put up a tremendous battle against their American rivals and tied on two wins each It all hinged on their final match race but it was the U.S.A.’s Stephanie Roble that came out on top moving Team USA forward to the next round. 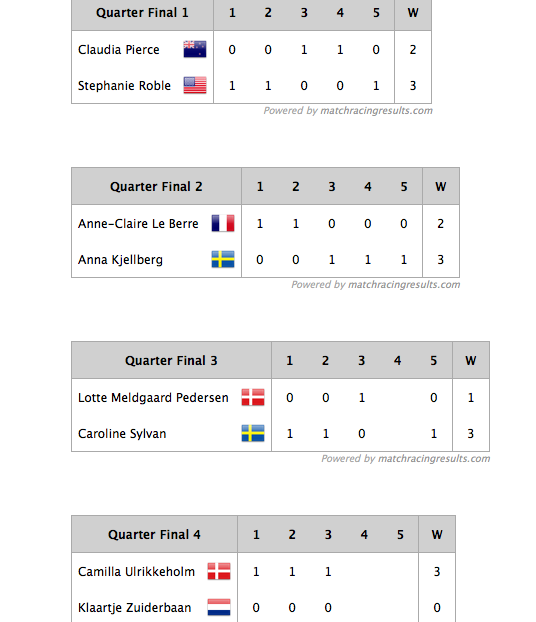 An equipment issue caused a frustrating delay in the last quarter final that was between Lotte Meldgaard Pedersen and Caroline Sylvan. With three races completed the two Scandinavians teams had no option but to wait patiently on the water because of a problem with one of the spinnakers. Once two other boats became available the crews transferred in and the final race of the day got underway. The final score of 3-1 meant Sylvan will join her fellow Swede in the penultimate day of the championship tomorrow. The next stage of the competition will be to decide the position of today’s losing skippers and they will sail to establish positions 5 to 8. The first two skippers to score at least one point shall be the winners, and sail against each other for 5th and 6th place, the losing skippers will sail against each other for 7th and 8th place.Today’s winning skippers will move into the semi finals tomorrow(Sat) and will provide a mouth watering day of sailing to look forward to.